Spacious villa with beautiful views, garden and private pool-all inclusive. 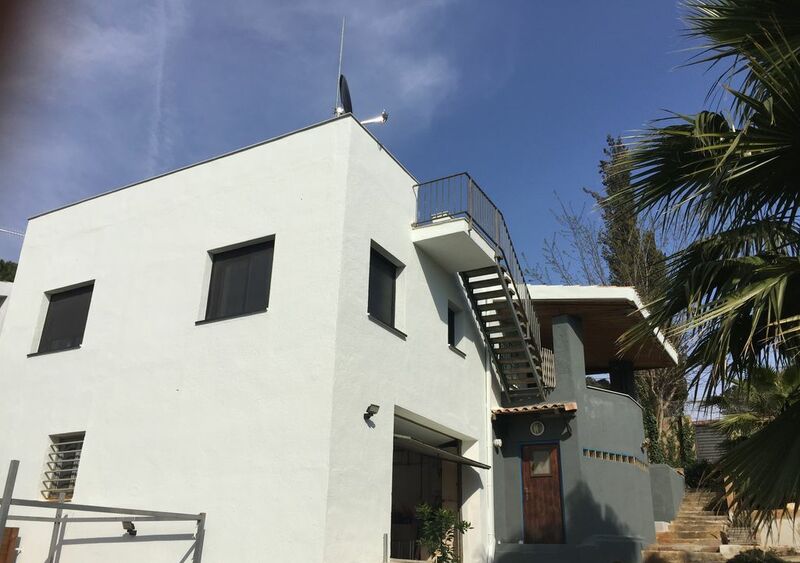 The house is located in the quiet, residential Mas Mora district with views and 5 km from Blanes and 8 km from Lloret de Mar. A few kilometers away is the beautiful Tossa de Mar. Sheets, towels, wifi, water, electricity and heating are included in the price. The villa is detached with its own newly constructed swimming pool of 9 m, with mosaic tiled and has variable LED lighting. The house is complete and contemporary. The bedrooms are equipped with new furniture. Garden furniture and reason to relax at the pool. A large garden and spacious roof terrace with stunning views, additional terrace at the living room. Besides sun, sea and beach at the many nearby coastal cities, you can also indulge yourself in Girona. This historic, homely town barely a half hour drive, has much to offer. The cosmopolitan city of Barcelona can be reached in an hour by car or by train. For lovers of Salvador Dali Figueras and Cadaques select places. In addition, there are the many beautiful nature reserves such as Montserrat and Montseny and the attractive city of Vic. Something for everyone and so the house is all year round rental! We had a lovely few days. Some relaxing by the pool, others exploring Catalonia. Thank you Would advise - don’t use sat nav to get there! We spent 10 days in October at this property. It was clean and spacious in a friendly neighbourhood. Beds were very comfy, pool area is fantastic with great views. Just a short drive to some fabulous beaches. The boiler was not working when we arrived which was just bad luck, the neighbours and owners were very helpful and it was quickly resolved with no fuss. Thank you. This was our 2nd stay in this comfortable home. Very well located-with comfortable beds. We are frequent European travelers and this home has some of the best beds we have slept in. We noticed this trip that there is an ocean view from the street. This contemporary home is just so very well located. Close to everything with excellent restaurants nearby. Griet and Patrick are among the best homeowners we have rented from- they address each and every need without hesitation. We are picky Americans and will stay here again. We are glad we can go on like this. Within two weeks we'll also change the kitchen to be able to offer still more comfort to our guests. The description of this villa is misleading. It's not contemporary, not as the pictures show it, and not in a quiet area. It does have good views and a nice pool. We arrived to the sound of barking dogs coming from close by. This continued into the evening and often carried on through the night. Every day was the same. The villa is not contemporary. It looks like a very tired old building that is being fixed up. Despite a picture on HomeAway showing a garage there is no off-street parking. The kitchen units look as if they are at least 30 years old. It's mostly in poor condition and very dirty in places, particularly round the edge of the work tops which were disgusting. We could easily remove large amounts of grease and grime. They need a new cleaner but the owner is obviously happy with the situation as she was there a week before us when it would have been in the same condition. The cupboards and fridge were full of other people's half used food which we had to remove. The living/dining room is big but quite empty with many of the pictured items nowhere to be seen. The sofa, and dining table and chairs are ok, but the very shabby TV stand looks like made from scraps of wood. The patio door opens onto a metal door which we found impossible to open properly. The main bedroom is ok for size but the bed looks as if is been home made. The picture shows a TV but there isn't one. The shower area is functional but in bad condition. Water drains so slowly that it often overflowed into a large dirty gap between tiles and floor. The shower is not thermostatic. It suddenly goes hot or cold if another a tap nearby is used. Toilet and bidet are new. The bedroom is the same room as the bathroom (no dividing doors) and tended to feel damp despite opening all windows. The shower in the second bathroom had a tendency to keep going cold. The pool area is new and looks good. The stairs to the roof terrace feel extremely unsafe. The first step is actual just big box with a broken lid. Access to the pool is down a lot of steps and a dirt bank. While we were there the coffee maker was replaced, and the neighbour needed to fix the tumble dryer. Something beeped at random times throughout the night and for no apparent reason the power goes off now and again. We would have walked away from this place but decided to not let it ruin our holiday. We just slept here and had breakfast. The compensation was that the area away from Mas Mora is very nice. We were surprised by this very negative review and would like to address some of the remarks. We strive to give a clear image of our house through our photos and description of the property. What you see on these photos, meets with reality. There are no dogs barking at our near neighbours, but in Spanish neighbourhoods, the number of dogs is high. You can indeed often hear them in the evening, but the house is situated in a neighbourhood and not in the middle of nowhere. It is true that you cannot park the car in the garage, but this is also not mentioned anywhere in the description. We will now explicitly write down in the description that parking in the garage is not possible, so that further misunderstanding can be avoided. The cleaning lady and the gardener do their utmost best to keep the house and garden clean and neat. The outside of the house has been recently completely repainted, after the interior had been repainted as well. All beds are brand new, in the living room there is a big TV and the TV in the bedroom has now been repaired. The coffee maker was replaced immediately and the neighbour is always prepared to help out if necessary. A drawer of the dryer needs to be emptied now and then when it has filled up with water. Washing machine, dishwasher and dryer are new, as are all other kitchen appliances. Everything in the house has been chosen with care, but tastes differ as far as interiors are concerned. On the photos you can clearly see the style of the décor. We are certainly open for criticism and suggestions, but not in this denigrating manner, because we do our best to make sure our guests have a nice and wonderful holiday. Very comfortable home in a fantastic location. Everything you need. Excellent mattresses. Owner and caretaker very attentive. Wonderful restaurants and markets nearby. Beautiful surroundings. Easy access to Girona and Barcelona. We will stay here again. We 've liked to welcome our first gasts from over the ocean! We are a family of 4 (kids 3 and 0 years old) and we had a wonderful time here in June. The house made us feel at home and we were very happy with the service from the owner. After asking if a cot for the baby was available, we were told that they would purchase one especially. - The house is located on a steep hill, so there are quite a few stairs to reach the swimming pool at the bottom. - Could use a lick of paint here and there. Kitchen is in good working order, but could do with some maintenance on cabinets and drawers. Laminate floor in master bedroom is peeling because of adjacent shower. All in all a very pleasant place to spend your holidays, good value for money. We are very glad you enjoyed your stay in- and outside the house! Untill know we have only re-painted the house inside. We are planning to repaint also outside. Thank you that you apreciated your vacation!